"Raises max MP by 1, and enhances magic and summon power. Also deals good physical damage." Lock the Keyhole in Atlantica. "Obtained in Atlantica. Easy to handle with an impressive recovery time after card breaks." 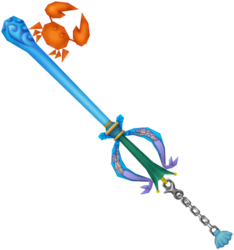 The Crabclaw is a Keychain for Sora's Keyblade which appears in Kingdom Hearts and Kingdom Hearts Chain of Memories. In Kingdom Hearts, Ariel gives Sora the Crabclaw once he locks Atlantica's Keyhole. In Kingdom Hearts Chain of Memories, the Crabclaw is the signature Attack Card for Atlantica. The Crabclaw's handle is green and resembles seaweed, while its guard is light blue with a purple mermaid adorning both sides. The shaft of the blade is light blue, thin, and resembles a jet of water. The teeth are comprised of a simple, orange crab with its claws pointing outward. The Keychain token is a light blue seashell. The Crabclaw's name is a clear reference to the crab that make up the weapon's teeth. The Japanese name, "Treasure of Sea", reflects the fact that it is awarded to Sora after sealing Atlantica's Keyhole. This page was last edited on 5 April 2019, at 15:09.